Last time we met, we saw Jesus make a declarative statement. Today he makes a promise to the disciples in John 14:15-31. Love Jesus…. keep his commandments. Ah, that easier said than done isn’t it? I was reminded in church yesterday that when God calls us his very own children he loves us with a love we can’t even truly fathom. This love is a support system that I don’t think we will ever truly understand. We can’t mess up too badly in his eyes. God sees us, he sees his own son. Ah that love that is. But it’s hard. The call of the old nature it’s strong isn’t it? Jesus doesn’t just leave us though. He makes us a promise. He will talk to God, his DAD. And his dad will give us another helper, someone who won’t ever have to go away for a while. A helper who will be with us ALL THE TIME. How great is that!?!?!?! This helper will be the Spirit of truth, the world doesn’t get this helper because they can’t see him or know him. But those of us who are disciples we CAN know him for he dwells with you and will be in you. 18 “I will not leave you as orphans; I will come to you. 19 Yet a little while and the world will see me no more, but you will see me. Because I live, you also will live. 20 In that day you will know that I am in my Father, and you in me, and I in you. 21 Whoever has my commandments and keeps them, he it is who loves me. And he who loves me will be loved by my Father, and I will love him and manifest myself to him.” You know what? I don’t blame the disciples for being confused sometimes. I know what will happen. Jesus will die, rise from the dead, be seen by lots of people and then ascend to heaven. I know this stuff and even so, this whole “in a little while the world won’t see me but you will” that’s confusing. How can we see him but the world can’t? How can we see him on earth when he’ll be ascended to heaven? It makes no sense to me. I understand the “I live, you also will live“. Christ will live forever, and through his death, we will to as well. Makes sense right? but what’s with this part “In that day you will know that I am in my Father, and you in me, and I in you. 21 Whoever has my commandments and keeps them, he it is who loves me. And he who loves me will be loved by my Father, and I will love him and manifest myself to him.” In what day? 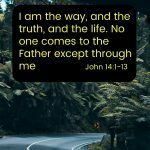 When we accept Christ as our Saviour? When the Holy Spirit indwells us? I don’t really understand since mixed into this statement is who keeps the commandments received loves Christ. Those who love Christ are loved by God and by Jesus and Jesus manifests (shows) himself to that person. So it’s all kinda linked isn’t it? 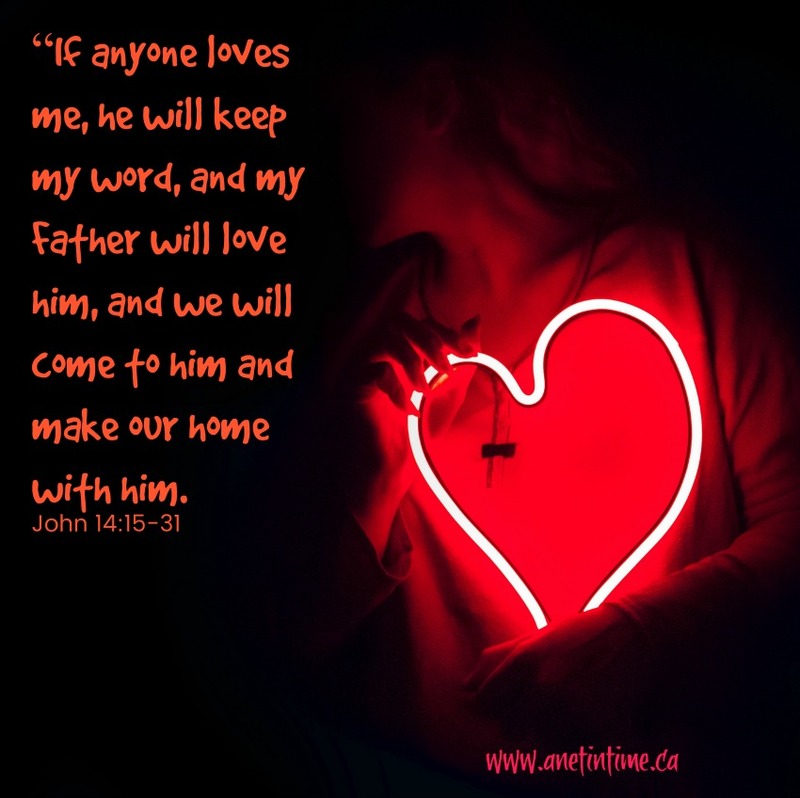 Love Jesus, keep his commandments, which SHOWS your love for Jesus, so God loves that person, which has Jesus loving them and it all circles round. The centrality is love. Actionable love, not just a feeling. Our love action is obedience, Jesus’ love action is to show himself to people, and God’s love action is to call us his very own children. Kinda this and yet more eh? The not Iscariot Judas asks a rather obvious question: “Lord, how is it that you will manifest yourself to us, and not to the world?” Good question to ask isn’t it? It gives Jesus a chance to reiterate. One who loves keeps Jesus’ commands. These commands are God’s. Keeping commands is loving God through Jesus, and God loves the obedient. And his “we will come to him and make our home with him.” Wow.. I like that statement. Shows the indwelling you know? Because THEY come to us and make their home with the believer. Jesus goes on to say that he teaches them these things while he is still with them. BUT a helper will come, sent from God, who will also teach them things and help them remember what they have already been taught. I feel sad when I read these next words….and I shouldn’t. I feel sad for the disciples because as carefully as Jesus tried to tell them, they didn’t really understand what was going to take place. When Jesus died they hid away in fear. Jesus tried to warn them not to be afraid, to not let their hearts be troubled. Yet they did. Not until he rose from the dead did they lose that fear (partially) and not truly until Pentecost did they REALLY lose that fear. Speaking out in boldness then. WOW. Now though he tells them Peace… I give you my peace. Not worldly peace. MY peace. Don’t be afraid or worried. Rejoice with me that I am going back to the Father. Fret not. I tell you this so you will remember when the time comes. For the time is coming, the ruler of the world thinks he has a claim on Jesus but he doesn’t. Jesus is just being obedient to God. Remember this. Jesus obedience shows he loves the Father. I don’t know if my ramblings today are all correct thoughts, I felt confused for a good part of my reading today. So if you have insight, please, feel free to give me your thoughts. THANKS!